The election of Donald Trump to be the 45th President of the United States of America shocked and dismayed progressives across the country. What We Do Now, a collection of passionate manifestos by some of the country's leading progressives, aims to provide a blueprint for how those stunned progressives can move forward. Its powerful contributions -- from economists, environmentalists, activists, artists, politicians, and novelists -- will offer encouragement and guidance to practicing constitutionally protected acts of resistance throughout the unprecedented upcoming administration. 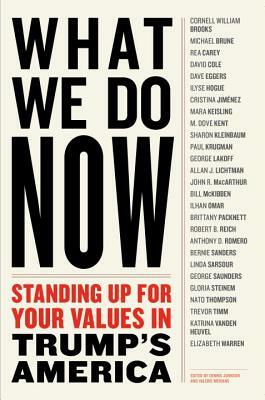 Among the contributors are Bernie Sanders, Elizabeth Warren, Gloria Steinem, Paul Krugman, Robert B. Reich, George Saunders and Dave Eggers as well the heads of the ACLU, the NAACP, the Sierra Club, the Arab American Association, the National GLBTQ Task Force, the Freedom of the Press Association, and other prominent activists. Allan Lichtman, Georgetown U prof and "Professor Predictor"